It is a nice question which composer wrote the most striking ‘opus one’. Beethoven’s three piano trios and Brahms’s C major Piano Sonata both have good claims, but Paganini’s 24 Caprices may well deserve the palm, being not merely the composer’s first published work but, in themselves, a publication that revolutionized the nature and technique of the instrument for which they were written. Although they were printed in 1820, Paganini is believed to have written them comparatively early in his career, probably between 1801 and 1807. They were his only publication for unaccompanied violin, and there is no record of his having performed them in public. Bearing a general dedication ‘To The Artists’ (A gli Artisti), they are a distillation of almost all his favourite techniques (though not his notorious harmonics) in phenomenally taxing musical contexts. Each Caprice explores different characters and personalities and extends the violinist’s technique in highly imaginative ways. In this sense they are technical studies—like the Mehrstimmige Etüden of his disciple Heinrich Wilhelm Ernst (recorded on Hyperion CDA67619). Nor were they the first example of such an étude-cycle for the violin: Paganini was obviously familiar with the collection of 24 Capricci that Locatelli had written as cadenzas for the twelve concertos in L’arte del violino. Even for present-day violinists, the challenges posed by the Caprices are daunting. These include wide-spaced notes to be played on the outer strings of the violin without sounding the strings in between, sustaining melody on one string while playing rapid harmonies or trills on another, imitations of other instruments, huge numbers of notes to be played in a single bow, not to mention rapid, highly chromatic figuration, trilled octaves and guitar-like chords—all of which may be required to be played at breakneck speed with the most elegantly stylish delivery. Despite the fact that there are twenty-four separate works, Paganini does not use them to cover the twenty-four available keys in the manner of Bach’s Well-Tempered Clavier, nor does he apportion them systematically. The Caprices in minor keys tend to be concentrated towards the beginning of the collection, and certain tonalities are more favoured than others—there are five Caprices in E flat major, for example, and three in A minor, including the celebrated No 24. 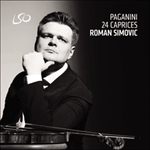 But each Caprice is complete and self-sufficient, no more requiring an accompaniment than J S Bach’s solo violin sonatas and partitas—though in fact both Schumann and Szymanowski made versions of some of them with an accompanying piano. Caprice No 1 in E major (Andante) is sometimes nick-named ‘L’arpeggio’, for obvious reasons. It contrasts chordal writing with a display of balzato (leaping) bowing, the bow ricochetting across all four strings. A development section in the minor introduces descending scales in thirds. This Caprice is modelled on No 7 from Locatelli’s L’arte del violino and thus, in a sense, establishes the tradition within which Paganini intends his Caprices to be viewed. Caprice No 2 in B minor (Moderato) then focuses on détaché playing; it demands wide stretches crossing over the strings and extensions in left-hand technique. Next, Caprice No 3 in E minor (Sostenuto – Presto) opens with a rather grave introduction in octaves, again requiring extension of the fingers of the left hand. After a more rapid middle section the Sostenuto music returns. Caprice No 4 in C minor (Maestoso) displays various kinds of double-stopping, while Caprice No 5 in A minor (Agitato), a popular encore showpiece, is a kind of rapid cadenza whose outer sections frame a passage of whirlwind scales that demonstrate spiccato bowing. Caprice No 6 in G minor (Adagio) presents an eloquent melody over a left-hand tremolo on the string below it, while Caprice No 7 in A minor (Posato) opens with an imposing passage in octaves, followed by an exhibition of flying staccato. Much of Caprice No 8 in E flat major (Maestoso) is concerned with passages played in thirds, some of them formidably difficult. 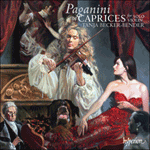 Caprice No 9 in E major (Allegretto) has earned the nickname of ‘La chasse’ (‘The hunt’). At the start of the piece the violin’s A and E strings are played sul tastiera (on the fingerboard) in order to imitate the sound of a flute (Paganini’s marking is imitando il Flauto), while the G and D strings are meant to imitate that of a horn (imitando il Corno). Musically it is essentially a study in double-stopping, with passages of ricochet (bouncing staccato) in the middle section. A different kind of staccato, played martellato (hammered) is the principal focus for Caprice No 10 in G minor (Vivace), while in contrast the expressive Caprice No 11 in C major opens with solemn chords (Andante) enclosing a Presto middle section. Caprice No 12 in A flat major (Allegro) features passages of rapid tenths, played across the strings; a chromatic descent in thirds prefaces and follows a rapid central section played at the point of the bow. Caprice No 13 in B flat major (Allegro) has gained the popular epithet ‘The Devil’s Laughter’. It begins with passages of scale-like double-stopping at a moderate speed, but a central section of very rapid runs exercises left-hand flexibility and shifting of position as well as détaché bowing in the right hand. Caprice No 14 in E flat major (Moderato) is a robust study in march-time, requiring its chordal writing to be attacked evenly but with panache; while Caprice No 15 in E minor (Posato) begins with expressive playing in octaves that leads to flamboyant arpeggios in the high register and passages of flying staccato. The rapid semiquaver patterns of Caprice No 16 in G minor (Presto) are contrasted across high and low registers. Caprice No 17 in E flat major (Sostenuto – Andante) juxtaposes a simple tune in double-stopped sixths on the G and D strings with florid demisemiquaver runs and figuration on the A and E strings. There is an extended, famously difficult central section in octaves. Caprice No 18 in C major (Corrente: Allegro) has a fanfare-like introductory figure on the G string played in numerous different positions, and a central section built upon rapid scales in thirds. Considerable bowing control is called for in Caprice No 19 in E flat major (Lento – Allegro assai), while Caprice No 20 in D major (Allegretto), in its central section, resourcefully employs the D string as a bagpipe-like drone, which forms the underpinning to a sweetly lyrical melody played on the A and E strings. The beautiful opening and closing sections exploit wide-spaced double- and triple-stopped chordal writing. Caprice No 21 in A major (Amoroso) opens with an almost operatic melody (the marking Amoroso perhaps suggests we should imagine a love scene) played in double-stopped sixths, which is followed by another scintillating display of up-bow staccato. Caprice No 22 in F major (Marcato) has outer sections of grandiose chordal writing, with martellato bowing in the central episode. Caprice No 23 in E flat major (Posato) is a more episodic display piece, demonstrating a variety of techniques, preparing the way for the twenty-fourth and last Caprice. The climax of the whole cycle is the famous Caprice No 24 in A minor (Quasi presto). In contrast to the simple ternary or binary forms of the other Caprices, No 24 is elaborately structured as a theme, eleven variations and finale. The theme is Paganini’s most famous, and has been subjected to countless variation-works by, among others, Liszt, Schumann, Brahms, Rachmaninov, Blacher, Lutoslawski and Andrew Lloyd Webber. This is because it is essentially a brilliantly conceived harmonic skeleton, which exerts an irresistible appeal to be clothed in flesh of musical substance, as Paganini himself does throughout. This splendid work not only sums up the technical challenges of the previous Caprices but adds two new ones—a scintillating section played only with downward bow-strokes and another that alternates fast bowed notes with plucked ones in the left hand, at astonishing speed. Quel compositeur signa le plus saisissant «opus un»? Délicate question. Beethoven et ses trois trios avec piano, Brahms et sa Sonate pour piano en ut majeur peuvent prétendre à la victoire, mais la palme pourrait bien revenir à Paganini: non seulement les vingt-quatre Caprices furent sa première œuvre publiée, mais ils révolutionnèrent la nature et la technique de l’instrument auquel ils s’adressaient. Ils furent imprimés en 1820, mais on pense que Paganini les écrivit plutôt au début de sa carrière, probablement entre 1801 et 1807. Ils furent son unique publication pour violon solo et aucun compte-rendu n’indique qu’il les ait jamais joués en public. Portant une dédicace générale (A gli artisti, «aux artistes»), ils distillent presque toutes ses techniques favorites (mais pas ses fameux harmoniques) dans des contextes musicaux d’une difficulté phénoménale. Chaque Caprice explore différents caractères, différentes personnalités, et développe la technique du violoniste de manières fort inventives. Ce sont, en ce sens, des études techniques, comme les Mehrstimmige Etüden de son disciple Heinrich Wilhelm Ernst (enregistrées sur le disque Hyperion CDA67619). Paganini ne fut pas, non plus, le premier à consacrer une étude-cycle au violon: à l’évidence, il connaissait le recueil de vingt-quatre Capricci que Locatelli avait écrit en guise de cadenzas pour les douze concertos de L’arte del violino. Même pour les violonistes actuels, les défis posés par les Caprices sont intimidants. Il y a des notes très espacées à jouer sur les première et quatrième cordes, sans faire sonner les deux du milieu (il faut tenir la mélodie sur une corde tout en jouant des harmonies rapides ou des trilles sur l’autre), des imitations d’autres instruments, d’énormes quantités de notes à jouer en un seul coup d’archet, sans parler des figurations rapides, extrêmement chromatiques, des octaves trillées et des accords guitaresques—le tout devant être joué à une allure folle, avec le plus d’élégance possible. Bien que ce soient vingt-quatre œuvres séparées, Paganini ne les utilise pas pour couvrir les vingt-quatre tons disponibles, à la manière de Bach dans son Clavier bien tempéré, pas plus qu’il ne les répartit de façon systématique. Les Caprices dans les tons mineurs tendent à être concentrés en début de recueil, et certaines tonalités sont plus privilégiées que d’autres—on trouve ansi cinq Caprices en mi bémol majeur et trois en la mineur, dont le célèbre no 24. Mais chaque Caprice est un tout autonome, qui n’exige pas plus d’accompagnement que les sonates et partitas pour violon solo de J. S. Bach—même si Schumann et Szymanowski en réalisèrent quelques versions avec accompagnement pianistique. Pour d’évidentes raisons, le Caprice no 1 en mi majeur (Andante) est parfois surnommé «L’arpeggio». À une écriture en accords, il oppose une démonstration de coups d’archet balzato (ricochet), où l’archet ricoche sur les quatre cordes. Un développement en mineur introduit des gammes descendantes en tierces. Ce Caprice est modelé sur le no 7 de L’arte del violino de Locatelli et instaure, en un sens, la tradition au sein de laquelle Paganini entendait s’inscrire. Le Caprice no 2 en si mineur (Moderato) se concentre ensuite sur le jeu détaché, qui exige de larges intervalles se croisant sur les cordes et des extensions dans la technique de la main gauche. Puis le Caprice no 3 en mi mineur (Sostenuto – Presto) s’ouvre sur une introduction assez grave en octaves, requérant là encore une extension des doigts de la main gauche. Passé un épisode central plus rapide, la musique Sostenuto revient. Le Caprice no 4 en ut mineur (Maestoso) expose plusieurs sortes de doubles cordes, cependant que le Caprice no 5 en la mineur (Agitato), un populaire bis virtuose, est une manière de cadenza rapide dont les sections extrêmes encadrent un passage de gammes éclair faisant valoir le coup d’archet spiccato. Le caprice no 6 en sol mineur (Adagio) présente une éloquente mélodie par-dessus un trémolo à la main gauche exécuté sur la corde inférieure; quant au Caprice no 7 en la mineur (Posato), il s’ouvre sur un imposant passage en octaves, suivi d’une démonstration de staccato véloce. Le Caprice no 8 en mi bémol majeur (Maestoso) s’attache surtout aux passages joués en tierces, parfois prodigieusement difficiles. Le Caprice no 9 en mi majeur (Allegretto) a gagné le surnom de «La chasse». Au début, les cordes de la et de mi sont jouées sul tastiera (sur la touche) pour imiter le son de la flûte (Paganini marque imitando il Flauto), les cordes de sol et de ré devant, elles, imiter le cor (imitando il Corno). Musicalement, c’est avant tout une étude de doubles cordes, avec des passages de ricochet (staccato sautillé) dans la section centrale. Le Caprice no 10 en sol mineur (Vivace) se focalise sur un autre genre de staccato, joué martellato (martelé), quand l’expressif Caprice no 11 en ut majeur s’ouvre sur de solennels accords (Andante) enclosant un Presto central. Le Caprice no 12 en la bémol majeur (Allegro) met en scène des passages en dixièmes rapides, parcourant les cordes; une descente chromatique en tierces inaugure et suit une rapide section centrale jouée à la pointe de l’archet. Le Caprice no 13 en si bémol majeur (Allegro) a gagné le surnom populaire de «Le rire du Diable». Il s’ouvre sur des passages de doubles cordes, en gammes, à moyenne vitesse, mais une section centrale de passages très rapides fait travailler la souplesse de la main gauche tandis que la main droite exécute des démanchés et des coups d’archet détachés. Le Caprice no 14 en mi bémol majeur (Moderato) est une solide étude de rythme alla marcia, dont l’écriture en accords doit être attaquée posément mais avec panache; quant au Caprice no 15 en mi mineur (Posato), il s’ouvre sur un expressif jeu en octaves menant à de flamboyants arpèges dans le registre aigu et à des passages de staccato véloce. Les rapides motifs en doubles croches du Caprice no 16 en sol mineur (Presto) sont contrastés sur les registres aigu et grave. Le Caprice no 17 en mi bémol majeur (Sostenuto – Andante) juxtapose une mélodie simple en sixtes exécutées en doubles cordes (de sol et de ré) à des passages rapides ornés, en triples croches, et à des figurations sur les cordes de la et de mi. Il y a une section centrale étendue, d’une difficulté notoire. Le Caprice no 18 en ut majeur (Corrente: Allegro) arbore une figure introductive façon fanfare, sur la corde de sol, jouée dans de nombreuses positions, et une section centrale fondée sur des gammes rapides en tierces. Le Caprice no 19 en mi bémol majeur (Lento – Allegro assai) requiert une considérable maîtrise de l’archet, cependant que la section centrale du Caprice no 20 en ré majeur (Allegretto) utilise ingénieusement la corde de ré comme bourdon de type cornemuse, qui vient soutenir une mélodie doucement lyrique jouée sur les cordes de la et de mi. Les splendides sections inaugurale et conclusive exploitent l’écriture en accords, en doubles et triples cordes, avec de larges espaces. Le Caprice no 21 en la majeur (Amoroso) s’ouvre sur une mélodie quasi opératique (l’indication Amoroso nous suggérant peut-être une scène d’amour) jouée en sixtes exécutées en doubles cordes et suivie d’une nouvelle démonstration scintillante de staccato en poussé. Le Caprice no 22 en fa majeur (Marcato) a des sections extrêmes écrites en grandioses accords, l’épisode central étant marqué par des coups d’archet martellato. Le Caprice no 23 en mi bémol majeur (Posato) est un joyau davantage épisodique qui dévoile tout un éventail de techniques, pavant la voie au vingt-quatrième et dernier Caprice. Apothéose du cycle, le fameux Caprice no 24 en la mineur (Quasi presto) se démarque des simples formes ternaires ou binaires des autres Caprices par sa structure complexe avec un thème, onze variations et un finale. Ce thème, le plus célèbre de Paganini, a fait l’objet d’innombrables variations, notamment de la part de Liszt, Schumann, Brahms, Rachmaninov, Blacher, Lutoslawski et Andrew Lloyd Webber. Cela tient au fait qu’il est d’abord une brillante carcasse harmonique qui aspire irrésistiblement à être revêtue de chair musicale—un appel auquel Paganini répond tout du long. Cette pièce splendide ne se contente pas de condenser les défis techniques des Caprices précédents, elle en ajoute deux nouveaux: une scintillante section tout en tirés et un épisode alternant des notes rapides exécutées avec l’archet et des notes pincées à la main gauche, à une vitesse hallucinante. Welcher Komponist das bemerkenswerteste „Opus 1“ schrieb, ist eine interessante Frage. Beethovens drei Klaviertrios und Brahms’ C-Dur-Klaviersonate hätten jeweils einen Anspruch darauf, aber Paganinis 24 Capricen dürften vielleicht die Siegespalme gewinnen, da sie nicht bloß das erste veröffentlichte Werk eines Komponisten sind, sondern in sich eine Veröffentlichung, die die Natur und Technik des Instruments, für das sie geschrieben wurden, revolutionierten. Obwohl 1820 gedruckt, wird angenommen, dass Paganini sie relativ früh in seiner Laufbahn schrieb, womöglich zwischen 1801 und 1807. Sie blieben seine einzige Publikation für unbegleitete Violine, und es gibt keine Belege, dass er sie je öffentlich spielte. Sie tragen eine allgemeine Widmung „An die Künstler“ (A gli Artisti) und sind eine Destillation nahezu all seiner Lieblingstechniken (allerdings ohne seine notorischen Flageoletts) in einem phänomenal anspruchsvollen musikalischen Kontext. Jede der Capricen erforscht andere persönliche Charaktere und erweitert die Technik des Geigers auf besonders einfallsreiche Weise. In diesem Sinne sind sie technische Etüden—wie die Mehrstimmigen Etüden seines Schülers Heinrich Wilhelm Ernst (auf Hyperion CDA67619). Sie waren auch nicht das erste Beispiel eines solchen Etüden-Zyklus für Violine: Paganini war offensichtlich mit der Sammlung von 24 Capricci vertraut, die Locatelli als Kadenzen für die zwölf Konzerte in L’arte del violino geschrieben hatte. Selbst für heutige Geiger bleiben die Herausforderungen, die die Capricen stellen, beängstigend. Es finden sich weit auseinander liegende Noten auf den äußeren Saiten der Violine ohne die mittleren Saiten zu berühren, die Durchführung einer Melodie auf einer Saite mit gleichzeitigen schnellen Harmonien oder Trillern auf einer anderen, Imitation anderer Instrumente, eine gewaltige Anzahl von Noten in einem einzigen Bogenstrich, ganz abgesehen von rapider, hoch chromatischer Figuration, getrillerten Oktaven und gitarrenartigen Akkorden—die allesamt oft mit halsbrecherischer Geschwindigkeit und äußerst elegant und stilvoll vorgetragen werden sollen. Obwohl es 24 individuelle Werke sind, nimmt Paganini nicht die Gelegenheit wahr, sie nach der Manier von Bachs Wohltemperiertem Clavier in den 24 verfügbaren Tonarten oder überhaupt systematisch anzuordnen. Die Capricen in Molltonarten konzentrieren sich auf den Anfang der Sammlung, und gewisse Tonalitäten kommen häufiger vor als andere—es gibt zum Beispiel fünf Capricen in Es-Dur und drei in a-Moll, einschließlich der berühmten Nr. 24. Aber jede Caprice ist in sich abgeschlossen und kann allein stehen. Sie braucht genauso wenig eine Begleitung wie Bachs Soloviolinsonaten und -partiten—obwohl sowohl Schumann als auch Szymanowski für einige Nummern Fassungen mit Klavierbegleitung anfertigten. Die Caprice Nr. 1 in E-Dur (Andante) wird aus offensichtlichen Gründen oft „L’arpeggio“ genannt. Hier wird akkordischer Satz mit einem Feuerwerk von balzato (Spring-)Bogen kontrastiert, in der der Bogen über alle Saiten federt. Eine Durchführung in Moll führt absteigende Skalen in Terzen ein. Diese Caprice hat Nr. 7 von Locatellis L’arte del violino zum Vorbild und etabliert somit in gewissem Sinne die Tradition, in die Paganini seine Capricen stellen will. Die Caprice Nr. 2 in h-Moll (Moderato) konzentriert sich dann auf détaché-Spiel; sie erfordert weite Spannung der Finger über die Saiten und Dehnungen in der Technik der linken Hand. Die nächste Caprice, Nr. 3 in e-Moll (Sostenuto – Presto), beginnt mit einer gravitätischen Einleitung in Oktaven, die wiederum die Dehnung der Finger der linken Hand erfordert. Nach einem schnelleren Mittelteil kehrt die Musik des Sostenuto zurück. Die Caprice Nr. 4 in c-Moll (Maestoso) stellt verschiedene Arten von Doppelgriffen zur Schau, während die Caprice Nr. 5 in a-Moll (Agitato), eine beliebte Zugabe, eine Art schneller Kadenz ist, deren Eckteile eine Passage wirbelhafter Skalen umrahmen, welche spiccato-Bogenführung zur Schau stellt. Die Caprice Nr. 6 in g-Moll (Adagio) präsentiert eine beredte Melodie über einem Tremolo der linken Hand auf der nächsttieferen Saite, während die Caprice Nr. 7 in a-Moll (Posato) mit einer imposanten Passage in Oktaven beginnt, gefolgt von einer Zurschaustellung fliegender Staccati. Ein Großteil der Caprice Nr. 8 in Es-Dur (Maestoso) widmet sich Terzpassagen, von denen etliche furchterregend schwierig sind. Die Caprice Nr. 9 in E-Dur (Allegretto) hat sich den Spitznamen „La chasse“ („Die Jagd“) eingehandelt. Am Anfang des Stücks werden die A- und E-Saite sul tastiera (am Griffbrett) gespielt, um den Klang einer Flöte nachzuahmen (Paganinis Anweisung ist imitando il Flauto), während die G- und D-Saite ein Horn imitieren sollen (imitando il Corno). Musikalisch gesehen ist sie im Wesentlichen eine Studie in Doppelgriffen mit Passagen von ricochet (springendem Staccato) im Mittelteil. Eine andere Art von Staccato, martellato (gehämmert), steht im Mittelpunkt der Caprice Nr. 10 in g-Moll (Vivace), während die ausdrucksstarke Caprice Nr. 11 in C-Dur im Kontrast dazu mit feierlichen Akkorden (Andante) beginnt, die einen Presto-Mittelteil umschließen. Die Caprice Nr. 12 in As-Dur (Allegro) stellt Passagen rapider Dezimen vor, die über zwei Saiten hinweg gespielt werden, und eine chromatisch absteigende Passage in Terzen umfasst einen schnellen, an der Spitze des Bogens gespielten Mittelteil. Die Caprice Nr. 13 in B-Dur (Allegro) hat den populären Beinamen „Teufelsgelächter“. Sie beginnt mit Doppelgriffpassagen in mäßigem Tempo, aber ein zentraler Abschnitt mit sehr schnellen Läufen trainiert Flexibilität und Lagenwechsel der linken Hand sowie die détaché-Bogenführung der rechten. Die Caprice Nr. 14 in Es-Dur (Moderato) ist eine robuste Etüde im Marschtempo, deren akkordischer Satz gleichmäßig, aber mit Elan gespielt werden muss, während die Caprice Nr. 15 in e-Moll (Posato) mit expressivem Spiel in Oktaven beginnt, die zu extravaganten Arpeggien in hohem Register und Passagen mit fliegendem Staccato führen. Die schnellen Sechzehntelfiguren der Caprice Nr. 16 in g-Moll (Presto) werden in hohen und tiefen Registern kontrastiert. Die Caprice Nr. 17 in Es-Dur (Sostenuto – Andante) stellt eine schlichte Melodie mit Doppelgriffen in Sexten auf der G- und D-Saite grazilen 32stel-Läufen und -Figurationen auf der A- und E-Saite gegenüber. Der ausgedehnte Mittelteil in Oktaven ist berühmt schwierig. Die Caprice Nr. 18 in C-Dur (Corrente: Allegro) hat eine fanfarenartige Einleitungsfigur über die G-Saite hinweg, und einen Mittelteil, der aus rapiden Skalen in Terzen besteht. Für die Caprice Nr. 19 in Es-Dur (Lento – Allegro assai) ist beachtliche Bogenkontrolle erforderlich, während die Caprice Nr. 20 in D-Dur (Allegretto) in ihrem Hauptteil einfallsreich die D-Saite als dudelsackartigen Bordun einsetzt, der eine zarte, lyrische Melodie auf der A- und E-Saite untermalt. Der wunderbare Anfangs- und Schlussabschnitt macht von weit gespreiztem akkordischen Satz in Doppel- und Tripelgriffen Gebrauch. Die Caprice Nr. 21 in A-Dur (Amoroso) beginnt mit einer nahezu opernhaften Melodie (die Bezeichnung Amoroso soll vielleicht andeuten, dass wir uns eine Liebesszene vorstellen sollen), die in Doppelgriffen in Sexten gespielt wird und der eine weitere funkelnde Zurschaustellung von Aufstrich-Staccato folgt. Die Caprice Nr. 22 in F-Dur (Marcato) hat grandios akkordisch gesetzte Rahmenabschnitte mit martellato-Bogenführung im Mittelteil. Die Caprice Nr. 23 in Es-Dur (Posato) ist ein eher episodisches Schaustück, das eine Vielfalt von Techniken demonstriert und den Weg für die 24. und letzte Caprice bereitet. Der gesamte Zyklus kulminiert in der berühmten Caprice Nr. 24 in a-Moll (Quasi presto). Im Kontrast zu den schlichten zwei- oder dreiteiligen Formen der anderen Capricen ist die Nr. 24 komplex als Thema mit elf Variationen und Finale strukturiert. Das Thema ist das berühmteste von Paganini und liegt ungezählten Variationswerken, darunter von Liszt, Schumann, Brahms, Rachmaninow, Blacher, Lutoslawski und Andrew Lloyd Webber zugrunde. Dies beruht auf der Tatsache, dass es im Wesentlichen ein brillant konzipiertes harmonisches Gerüst hat, das—wie immer bei Paganini—einen unwiderstehlichen Reiz ausübt, mit unterschiedlichem Material von musikalischer Substanz eingekleidet zu werden. Dieses herrliche Werk fasst nicht nur die technischen Herausforderungen der vorangegangenen Capricen zusammen, sondern fügt zwei neue hinzu: einen fulminanten Abschnitt, der ausschließlich mit Abstrichen gespielt wird, und einen, in dem sich mit erstaunlicher Geschwindigkeit schnell gestrichene und gezupfte Noten in der linken Hand abwechseln.